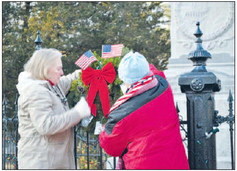 Blue Star Mothers Kathleen Kemp of Londonderry and Kathy Jerome of Hampstead placed a wreath on the war monument Saturday during the Wreaths Across America ceremony. LONDONDERRY -- Those who serve in the Armed Forces or who have died in the line of duty were remembered Saturday in a special ceremony held on Town Common. The national observance of Wreaths Across America, which honors those currently serving as well as soldiers who either lost their lives in the line of duty or whose last known status was Prisoner of War or Missing in Action, was led locally by several members of the Blue Star Mothers. Volunteers also placed more than 900 wreaths on graves at the State Veterans Cemetery in Boscawen. Several dozen residents, including a number of local veterans and representatives of the Londonderry American Legion, attended Londonderry’s ceremony. Many paused to wipe away a tear as the area’s latest war casualty, Derry’s Lance Cpl. Michael Geary, was remembered. The Derry Marine lost his life in Afghanistan last Wednesday, following five months of deployment. The Blue Star Mothers dates to January 1942, when a Michigan newspaper printed a coupon, asking mothers of servicemen to fill out and return, according to the organization’s website. After receiving more than 1,000 responses, a permanent organization was formed and mothers volunteered throughout World War II working in hospitals and train stations, sending care packages to soldiers, and working as part of homeland security. According to Londonderry resident and Blue Star Mothers spokeswoman Joanne Paradis, the Granite State branch has recently seen a rise in membership in the wake of the recent deployment of a National Guard unit to Kuwait. “We can’t even count how many members we have right now,” Hampstead resident and Blue Star Mom Kathy Jerome noted. Paradis, whose Marine son will be deployed to Afghanistan in March, said the local Blue Star Mothers branch meets monthly in Manchester.